It was made for my BIL's 60th which was last Saturday. He is a bike enthusiast and enjoys riding with his friends. My pouch with many zips I made at our Patch Workshop. Thank you to Kris and Peg for organising us for OPAM each month. They do help make sure I have at least one finish each month. Your BIL is going to love his biker quilt. That looks incredible and I love the geese. I also really like that bag. I need to make one for myself. Cute mug rugs too. I use my mug rugs all the time. cute mug rugs too and now to find things to fill the new pouch's pockets!!! What's a mug rug? I've not heard that terminology before. Your quilt is awesome...bet your BIL is going to be thrilled to receive it. Must have taken quite a while to make that. Oooo just spotted Needled Mom's comment...something to put your coffee cup on? Fantastic finishes! The secret biker quilt is very impressive. I hope your BIL loved it. Love the quilt for your BIL, I'm sure he will too. Great finishes too. Wonderful quilt for a bike enthusiast, great pouch bag lovely fabrics as are the mug rugs. what awesome makes! that quilt! he'll love it. thanks for the reminder to do a post too!! Awesome work with the finishes Maria. 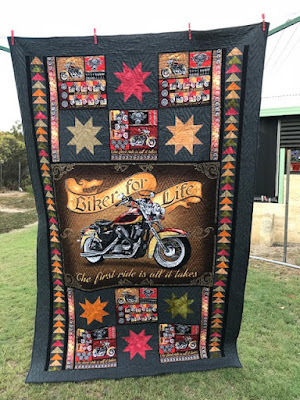 I hope your BIL loved his quilt - it looks fabulous and perfect for a biker!